Whether your children's ministry is 10, 100, or 1000, Hillsong Kids BIG will assist you in providing a fun and dynamic children's ministry experience. This interactive multimedia-based curriculum is a 13-session attention grabbing learning experience made up of 3 themes (3 BIG PICTURES), with 4 lesson topics per theme (4 BIG IDEAS). The goal is to present Christ-centred, Bible-based teaching that is relevant to practical living to empower children to lead and impact in every sphere of life. We are so excited to share what is happening in our church with our beautiful children, and we believe this will have a great impact in your own church with your children. Each BIG lesson topic centres on Bible-based teaching and applies to our every day lives. BIG gives you high quality teaching elements that are simple to use and easy to understand for both you and your leaders. 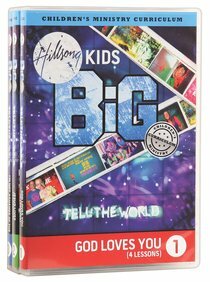 BIG can be used in a children's ministry of 10, 100, or 1000 children. It will work in your weekend church service programs, midweek services, and school holiday programs. Just choose what elements you want to include in your program, to make it work with your service and children. BIG is affordable and cost effective for every church and children's ministry. You only print the items you need. You will be amazed at the value for money. Using state of the art production and top notch creative programming you can be assured that the multimedia videos are of the highest quality and standard. You will receive interactive multimedia DVDs containing everything you need to run BIG in your children's ministry. The DVD features 13 interactive teaching video clips, 13 question segments to reinforce the topic, accompaniment track videos with full stereo and split track files for you to use during Praise and Worship, high retention Bible memory verse segments plus all print material for the curriculum including small group studies, activity sheets, graphic design, logos and leaders manuals. BIG PICTURE is the overall theme for 3 lessons. The BIG MESSAGE is the interactive teaching DVD learning experience for each BIG IDEA. These teaching video clips will give Bible-based lifeapplication lessons for children. Reinforcing the BIG IDEA through an interactive question and answer time. High retention Bible memory verse segments for each BIG PICTURE, including actions to assist in increasing your children's scripture retention. Kids Discipleship Groups - reproducible age specific small group studies for each lesson. Energetic and inspiring praise and worship - just for kids! Featuring accompaniment track videos with full stereo and split track files for each video for you to use during Praise and Worship in your children's ministry. The BIG Remix is an interactive video clip that reinforces the BIG POINT and BIG WORD through quizzes and questions. A great idea to use at the end of your service, as your children are collected by their parents. High impact service countdown video to build atmosphere at the beginning of your program. Video loop with music for you to play while you minister to your children or during KDG time. - Accompaniment track videos with full stereo and split track files for each video for you to use during Praise and Worship with your children. About "Tell the World (Pack) (Hillsong Kids Big Curriculum Series)"